Why’d I write the Missing Pieces Plan? “What if ‘something happens,’ how will you know where I hid the pearls?” My mother-in-law asked me this before going into surgery a few years ago. Then, my mom had a freak accident where, for a moment, we weren’t certain she would make it. I realized, how would I know where her important documents where, if she had a Will, if she had an Advance Directive, how she would want to be celebrated, and most importantly all her stories. “Something happens” to all of us…one day. And, we all plan to plan for it…one day. The funny thing is, even after twenty years helping families plan, none of this occurred to me until it mattered. And, it will matter to all of us one day. “My family will know what to do.” It’s what many of think when it comes to planning for a life without us in it. Our family will know our wishes, our wants. Making our wishes known is, I would argue, one of the greatest gifts we can give our loved ones. It provides a sense of peace. Let’s call it peace of mind and that, is priceless. The message I hope to spread with the Missing Pieces Plan is that by planning and sharing our wishes, we give our loved ones a precious gift, a priceless gift – peace of mind. They will know what to do because we’ve planned for it and even better, we’ve told them our wishes. How would I know my mother-in-law’s wishes? My mother’s wishes? My own wishes? Ask them. Make them. Write them. Share them. I would only know my wishes if I took the time to think about what I want and write them down. I could decide the life I want my daughters to have if “something happened” which lead me to craft the life I want for them now. What’s important to me? Education? Values? How do we live into that life now? Crafting the life you want to live and leave can be fun, fulfilling, meaningful, enjoyable. 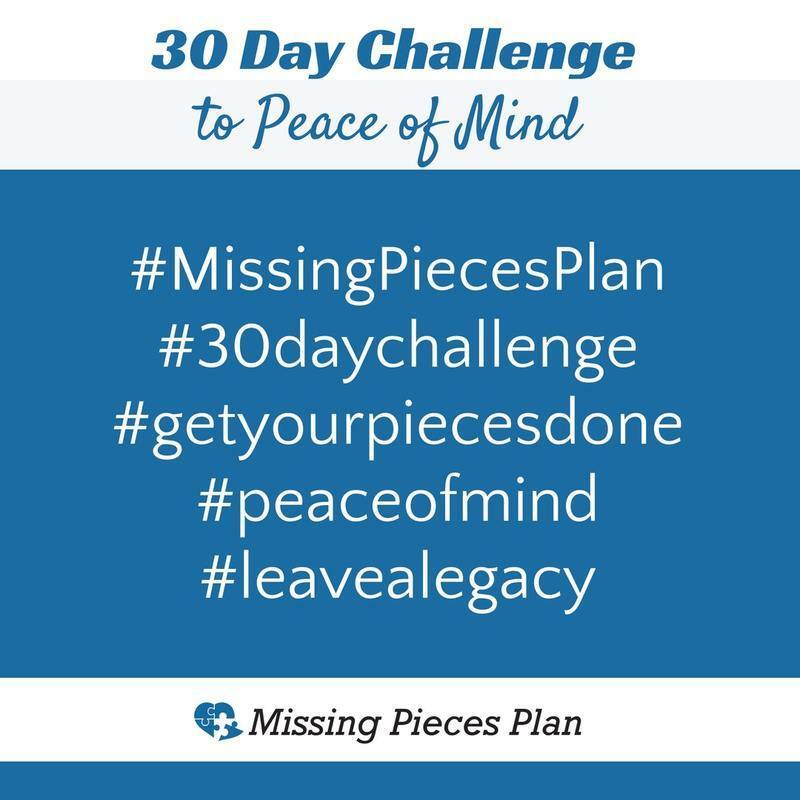 For the month of January, I’m reposting the 30 Day Missing Pieces Plan CHALLENGE! JUST Spend 1-2 minutes a day for 30 days towards getting your pieces DONE! And, you’re on your way to peace of mind. JOIN ME on the 30 DAY CHALLENGE. Follow the Missing Pieces Plan on Facebook, Instagram, Pinterest, Twitter and LinkedIn for your daily challenge! Peace of mind is a priceless gift. Gift on! Bring on the New Year!